Assassin’s Creed is one of the very first games that I purchased after getting my hands on a PlayStation 3 way back in early 2008. From the moment I inserted the disk, I found myself really enjoying the game, and why shouldn’t I have done so: the experience seemed to have everything going for it. Technically, Assassin’s Creed was executed very well. At the time, it was doubtless the best looking video game that I had ever seen (and it still holds up amongst higher fidelity games that came after it). The sound design in the game was rather minimalist, which seemed to suit the general tone of the experience. The voice acting, for the most part, was fantastic. While some of the ambient dialogue heard throughout the city seems slightly unexceptional, each of the main characters was voiced convincingly and with a great deal of personality. This excellence in technicality made room for a really interesting narrative to take root. 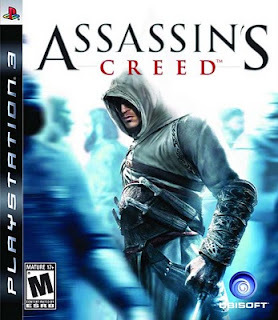 The main story of Assassin’s Creed is framed by taking on the role of a bartender in the near future named Desmond Miles, who is abducted by a scientific organization in order to test a device they’ve invented called the Animus. The Animus is used to extract memories of Desmond’s ancestors from his DNA. The device puts Desmond in control of a specific ancestor named Altaïr, who is a member of a secret order of assassins in the Holy Land during the Crusades, which makes for an especially interesting and relatively unique setting for a video game. With Altaïr under my control, I found myself traveling between the assassin headquarters in Masyaf and the cities of Acre, Jerusalem, and Damascus in order to gather information about—and then execute—various men of power at the behest of the headmaster of the assassins, Al Mualim. In order to do this, I became quite familiar with Altaïr’s primary skills: specifically climbing buildings and murder, both of which make really satisfying game mechanics. Secondary is the directive that as an assassin you must retain your secrecy amongst autonomous citizenry of the densely populated cities as indicated by an anonymity meter. So I had a game that was (this is me being reductive) part Grand Theft Auto-style open world, some Prince of Persia verticality, and a little Metal Gear Solid 4 stealth murder. All of this should have added up to a really enjoyable experience, and yet I found myself getting bored with the game. You climb to the top of a tall building, which allows you to see where all your possible tasks are located. Complete a few intelligence gathering missions, which include eavesdropping, picking someone’s pocket, beating up a crony, or running an errand for a fellow assassin (which involves either collecting flags or performing a few stealth assassinations). Return to the local safe house with the information you’ve gathered, and get permission to carry out the assassination of your primary target. Don’t get me wrong. The formula was a really gratifying one, but it got old, and I stopped playing. I would go back to the game every few months, and when I did, I found it gratifying all over again. Shortly thereafter, I would find myself getting bored with the game, and I'd stop playing only to return to it a few months later. Eventually, I finished it. Assassin’s Creed is a game that was almost marvelous but missed the mark ever so slightly. And unlike most games that fall short, it managed to sell well enough for Ubisoft to produce a sequel (currently available at your local retailer… buy it now). In the end, it was relatively easy for me to over look its singular transgression, and I really enjoyed the game as a whole when parceled out over the course of the two years it took me to finish it.